Our recent work to connect human, animal, and environmental health in the US and around the world. Interacting with animals at zoos and other animal exhibits can be fun and educational. But even the animals we see at the zoo can carry harmful germs that make us sick. Animals can spread harmful germs even if they’re healthy and look normal. 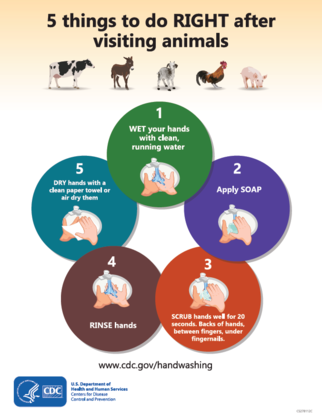 Always wash your hands with soap and water right after visiting animals. Never eat, drink, or put anything in your mouth around animals. Older adults, pregnant women, young children, and people with weakened immune systems should be extra careful around animals. If you work at a zoo or animal exhibit, check out the updated Compendium of Measures to Prevent Disease Associated with Animals in Public Settings. Find updates about One Health, diseases spread between humans and animals, new infographics, and much more on our home page.